The Ganges stretches almost 1,600 miles from its Himalayan source waters before draining into the Bay of Bengal. 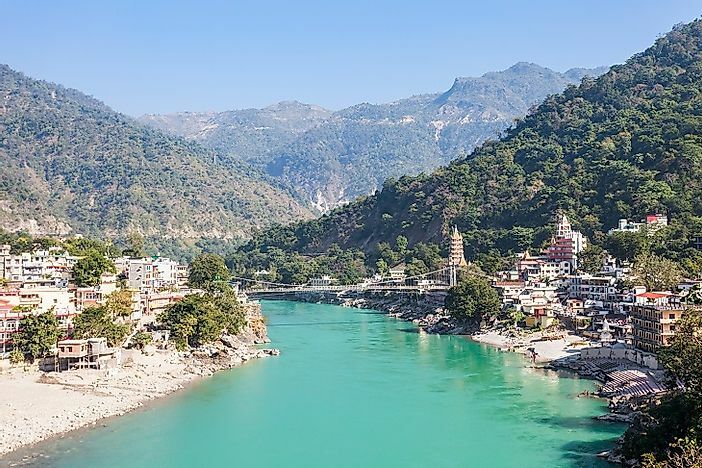 The Ganges River flowing through the city of Rishikesh in the Uttarakhand state in India. The Ganges River flows through parts of the territories of the two countries of India and Bangladesh, and along the way covers a distance of 2,520 kilometers (1,560 miles). The Ganges Basin is much broader still, and includes numerous tributary rivers originating in Nepal, China, and Myanmar alike. The Delta of the Ganges is also a rare phenomenon. There, the plot of land between two of the Ganges's arms, the Hooghly and Meghna, is called the Sundarban. This area is a complex web of streams, rivers, and bays along the Bay of Bengal, an area 265 kilometers long and 350 kilometers wide. Constantly changing landscapes are quite characteristic of the Ganges's exit into the Bengal Bay. There, pieces of land may rise up from the water and just as quickly disappear, sometimes creating silty and sandy islands in the process. Those that remain for extended periods of time (several months) are rapidly covered by dense vegetation in the beginning of season, only to be seen going back down under the water completely once again at the season's end. In addition to the unprecedented importance for the agricultural activities in the region, and serving as a source of drinking water for humans as well as water for all types of industrial production, the Ganges is a river of which the greatest number of legends have been written. In the Hindu religion, the Ganges is called the "Most Sacred River", and one which has a purely divine origin. The Lord Shiva, who acts in the role of Transformer of the Universe in the Hindu sphere of beliefs, has stopped the flow of destructive energy bound to the earth. Once at the head of Shiva, cosmic energy is transformed and diverted into the Ganges River. Hydrologically, the source of the river is located on the southern slopes of the Himalayan glacier Gangotri, and from there it flows through the most densely populated area of the Eurasian continent (India and Bangladesh), where, according to various estimates, live somewhere between 400 and 500 million people. Indian environmentalists point out that the Ganges, despite of the abundance of biochemical pollution, has the ability to restore itself to its pre-industrial state. However, Western experts' studies often call the Ganges one of the most polluted rivers in the world. Around half a billion people are today inhabiting the banks of the Ganges, largely depending upon its water quality to sustain their needs, and seeing there lives regularly affected by seasonal floods. The Ganges becomes dirty because of the drains discharging into the river, which are filled with all kinds of population from both households and industrial enterprises. Major cities along the river are continuing to rise in number, and these have a strong impact on the environment. The shortage of garbage processing enterprises in the region also leads to the cluttering of the Ganges's shores with litter, resulting in havoc as flooding often carries tons of human waste right into the Ganges. The water probes taken in recent years show that the concentration of biological waste in the river's waters are 100 times higher than permissible norms. The ritual cremations in the Ghats, special religious ritual places, are taking place very close to the coastline. After burning of corpses, the remains are dumped into the river. However, the poor, who can not afford cremation costs but come to die in the holy city of Varanasi on the Ganges's banks, as well as dead unmarried girls, pregnant women, and children, according to the tradition from times immemorial, do not qualify for burning. Instead, their corpses are immediately thrown intact into the river. The river and its human inhabitants are then forced to deal with these remains in the waters. The Ganges provides shelter to more than 140 kinds of different fish and 90 species of amphibians. Among the most endangered river dwellers are the Ganges river sharks, as well as native dolphin species. Birds that live in the river basin are also unique, and and many cannot be found in any other parts of the world. This area is the home to rare species of mammals as well, including brown bears, foxes, snow leopards and other large cats, several species of deer, porcupines, and others. There is also a large variety of butterflies and other rare insects seen along the Ganges's banks. The construction of a dam and hydroelectric power station near Farraka, close to the border with Bangladesh, led to the removal of water from the arm of the Ganges known as the Bhagirathi, a river which further flows in West Bengal near Calcutta. This dam has long been a source of disputes between India and Bangladesh, which had been settled on the basis of discussions held in 1996. A lack of perpetual flow during the summer months used to result in droughts in Bangladesh, and made the country more vulnerable to flooding in other times of the year. Nevertheless, the project of connecting channel of the Brahmaputra to the Ganges in order to improve the flow of water has not yet been implemented, though doing so could potential mitigate these destructive effects.